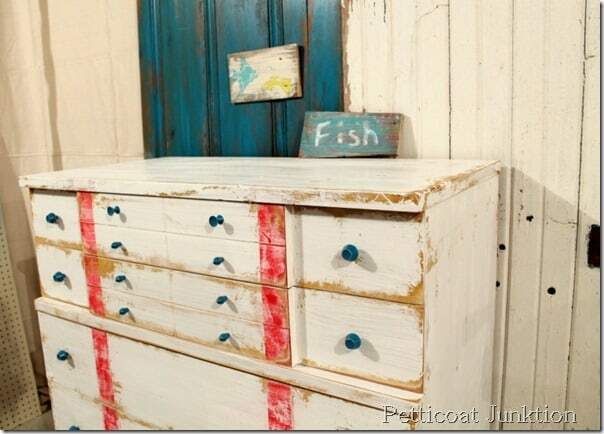 It’s Monday and I have a great Nautical Style Furniture makeover to share! My husband waited on me all day yesterday, cooking…cleaning…helping with projects…just being sweet. I received happy Mother’s Day calls from both of my children, one lives in Alaska and the other was out of town. So I had a great weekend and I’m ready for whatever this week brings. But right now I have a project to share with you. 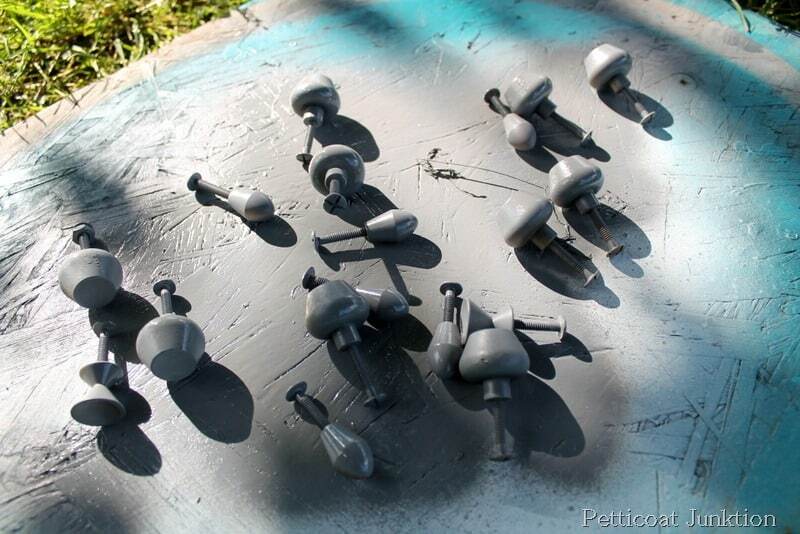 It was missing a couple of pulls so I found some replacements and decided to spray paint the lot. There were so many pulls I hated to spend the money to buy new ones. I used Rust-Oleum Spray Paint Primer in Gray as a base coat. 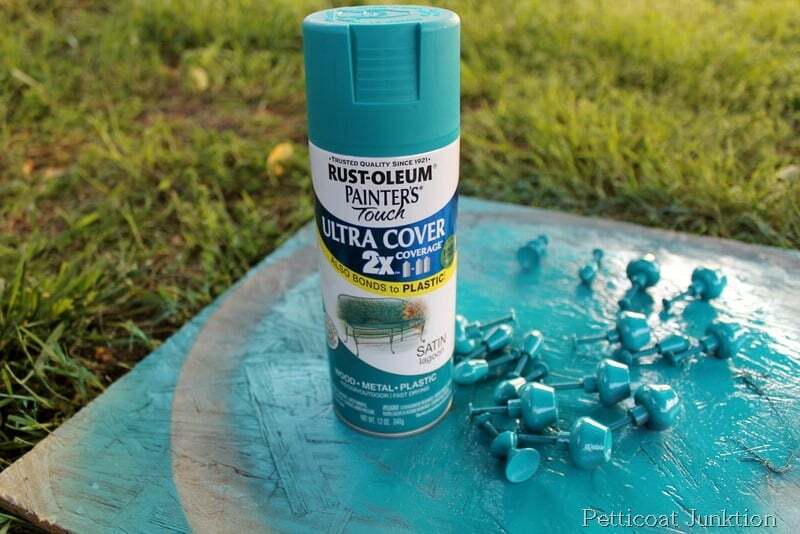 After the primer was dry I sprayed the pulls with my new favorite color, Rust-Oleum in Satin Lagoon. 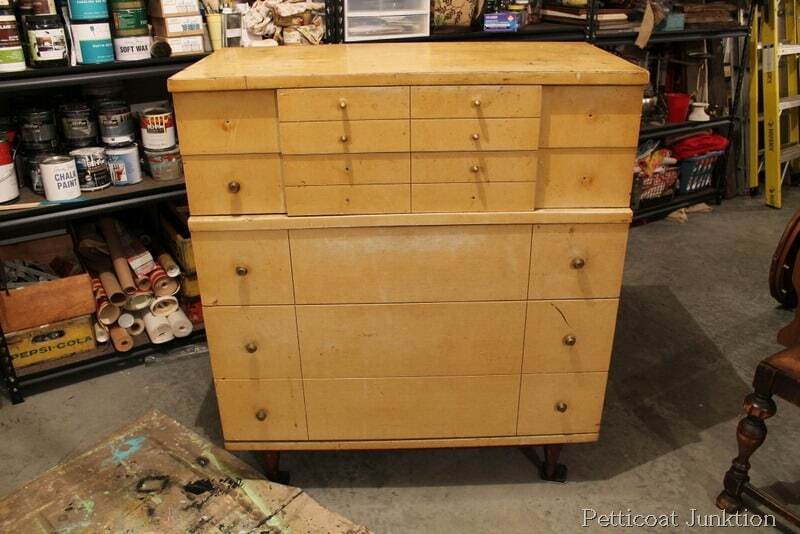 The chest was really beat-up with gouges in the top and sides so I went with a heavily distressed finish in satin white. I had a vision when I started the project of a single red stripe down the front but I put on the pulls just to see how it looked at this point. No, it needs that stripe or something. I painted on one stripe and that didn’t look right so I painted another one so the look was symmetrical. I also painted the legs and bottom board with paint I had mixed to match the satin Lagoon spray paint. I do really, really like this color. So what do you think. Did I go overboard (pun intended) on the makeover? Would you call this chest Nautical Style Furniture? 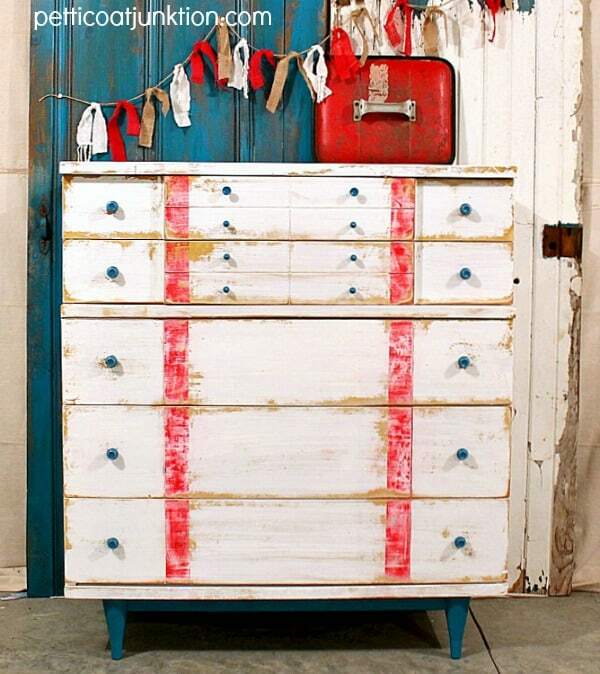 I painted a Beach Inspired Dresser with Numbers last week and this makeover is similar, yet not, if that makes sense. I agree–absolutely am in love with satin Lagoon!! 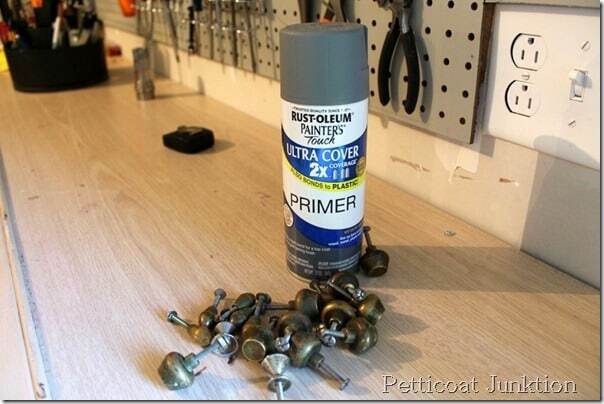 I have used it on a few projects and it has such richness! Great make over–you rocked it! You did a great job on this. I love it! Oh….GOSH…..Love this one too! 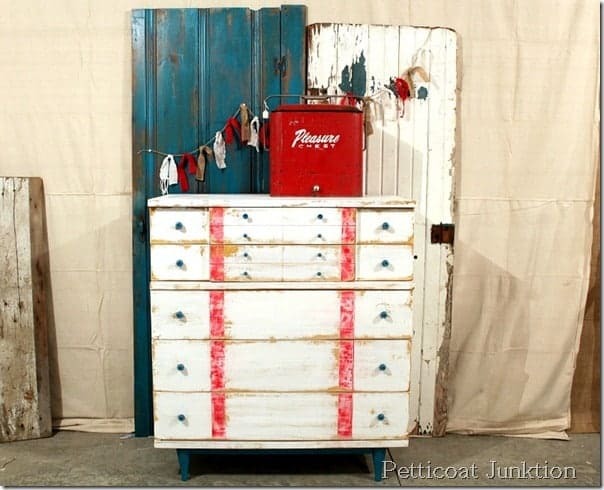 Love the red and teal together!! Thank you again for sharing your beautiful makeover with us! It really is so, so pretty now. 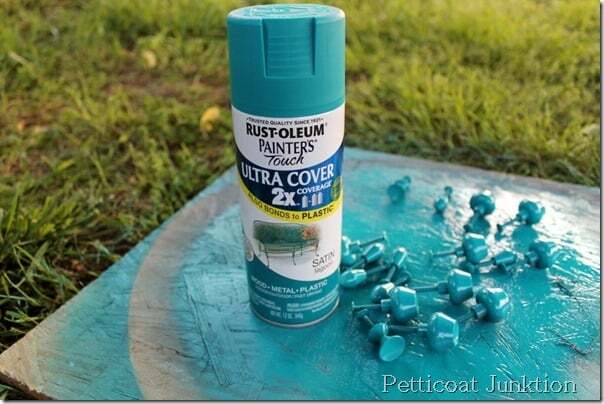 I can totally see why you love that pretty Lagoon color too. It’s dreamy! I definitely see the nautical vibe, Kathy. 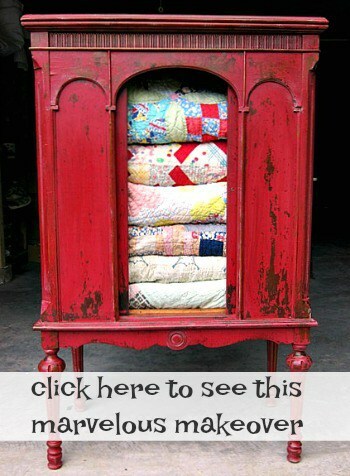 A little grain sack inspiration, too. 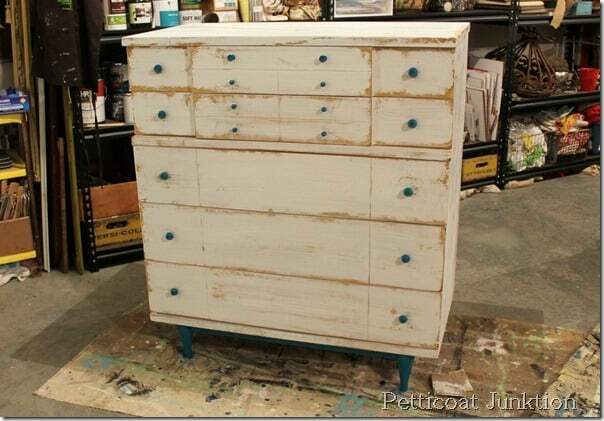 Love how this dresser turned out. I’m guessing it sold pretty quickly. Love how it turned out! I’m featuring it this week in the Power of Paint Party. Love this one Kathy!! You always do such great work. 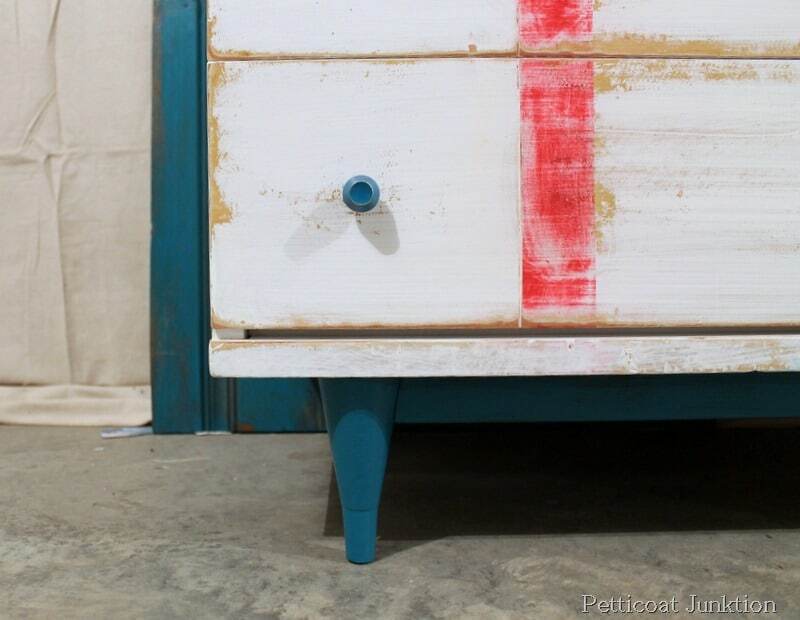 I love the knobs, great combo! You definitely did NOT go overboard! 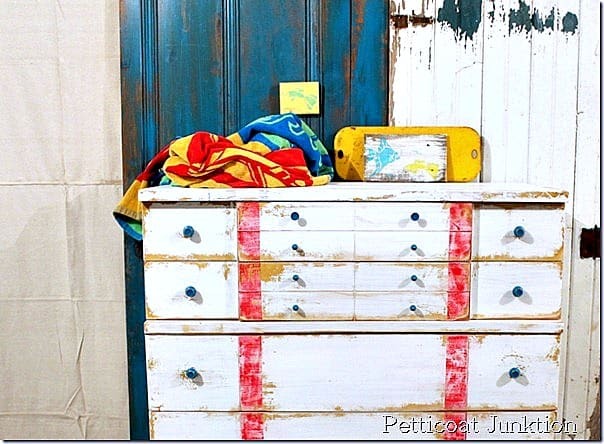 I love the color combo and think this dresser could be a perfect fit for Coastal Living mag. I adore red and blue together but find it hard to keep it from looking to 4th of July-ish. The teal tone works perfectly to keep it from being too Uncle Sam! Love it!!! It looks really awesome!! love it! There are few things I love as much as a fabulous furniture transformation, good on ya! I just can’t tell you how much I LOVE this makeover. 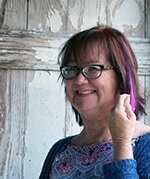 Kathy that is gorgeous. I absolutely love it! Thanks Beckie and thanks for stopping by! I’m thinking of keeping this piece for myself, not sure yet. It is darling, wonderful, fun and perfect! Both your Beachy chests look terrific! I particularly like that while they both have a nautical feel and inspiration, neither is too masculine. Ultimate flexibility! This is one awesome transformation. 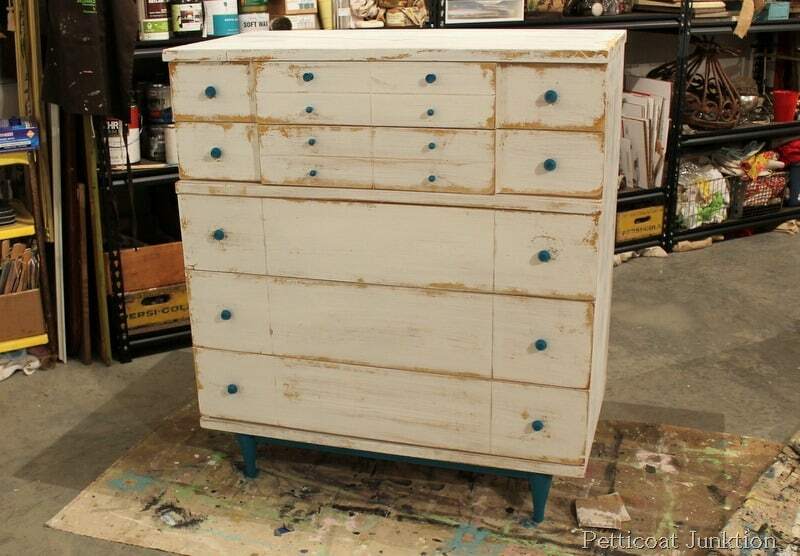 Love the distressed white with the blue knobs. Then you added the two red stripes (Yes, you were right – it had to be two!) I love its little blue feet. This is si pretty. You are so talented and creative! Pinning. thanks Lydianne, I remember you from our paint class. You can do this too!